By Jim Casella. Percussion Ensemble. 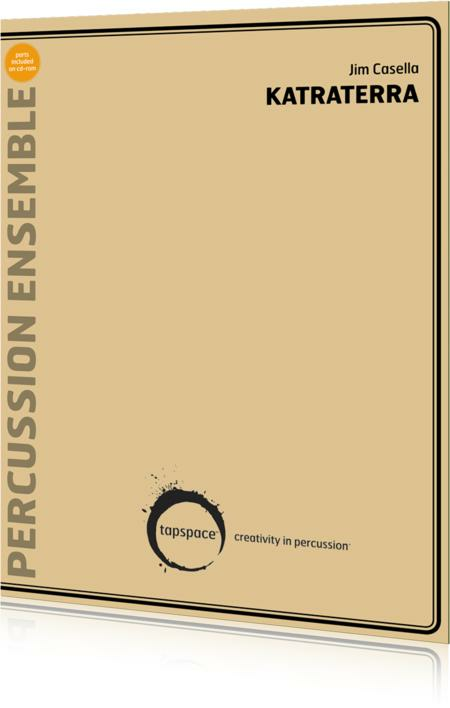 For glockenspiel, xylophone, vibraphone, marimba (4 octave), marimba (4.3 octave), 4 timpani, chimes, 4 cowbells, log drum, 2 china cymbals, 5 suspended cymbals, 2 brake drums, 3 woodblocks, 2 triangles, splash cymbal, hi hat, 4 toms, chinese opera gong, kick drum, tambourine, low conga, bongos. (9 players). Level: Advanced. Full score and CD-Rom (containing printable parts). Duration 5:00. Published by Tapspace Publications. Written for nine players, "Katraterra" is a concert piece which uses a variety of textures, instruments, and techniques to create a driving and intense feel. The 5/8 time signature dominates the groove of Katraterra with three emphasized beats of 1, 3, and the upbeat of 4, creating the motive which drives the 16-note based ostinato and all surrounding melodies. This weaves in and out of other time signatures, but is intended to happen smoothly without obvious perception to when these changes occur. This, along with the inherent syncopations throughout, creates a challenging ensemble atmosphere. With driving solo statements, complex interwoven rhythms, and an organic ostinato to drive it, this piece is sure to offer an intense and entertaining musical experience.